Trips down the Cattaraugus Creek average 3 hours on the water. As of 01/01/2019 all whitewater raft trips on the Cattaraugus Creek (Gowanda, NY) will be run solely by Zoar Valley Canoe & Raft Co. Although ACO will no longer be their outfitting partner at that location we will gladly answer any initial inquiries you may have about the trip as well as put you in touch with their office to make a reservation. From Buffalo - Follow Route 62 into the village of Gowanda. Cross the bridge and turn right onto North Water Street. Park in the municipal lot and walk back across the intersection onto South Water Street. Look for our sign, #9 South Water Street. From Rochester - Take Route 90 West to Batavia. Turn left onto Route 98 South. Follow Route 98 into Arcade. Turn right onto Route 39 West. Stay with Route 39 into the village of Gowanda. Cross the bridge and turn right onto North Water Street. Park in the municipal lot and walk back across the intersection onto South Water Street. Look for our sign, #9 South Water Street. March 24 through May 20 (water levels permitting), Saturdays and Sundays. Call for departure times. Weekday trips available upon special request, with advance notice. Cost: $65.00 per person (canyon section) $40.00 per person (lower section), and includes a post-trip pizza party at our Gowanda Site Office. If the trip is paid for in full at least two weeks prior, all wetsuit rental fees will be waived. Due to the time of year, wetsuits are mandatory. 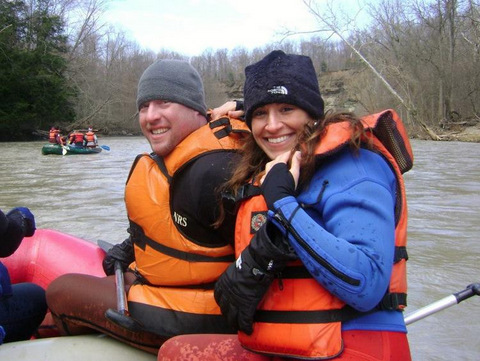 Early springtime rafting on the Cattaraugus Creek is not necessarily for everyone. It may not be very warm and the rapids can be intimidating. However, water levels permitting, if you're active and adventurous, you will have the opportunity to paddle some class III & IV whitewater through the Zoar Valley State Forest Preserve, one of the most remote and pristine regions in Western NY. The watershed for Cattaraugus Creek is comparatively small and as a result, the flows can be sporadic. The creek can be exciting one week and relatively dry the next. Conversely, it can be at an average level early in the day and following a localized heavy downpour, will turn into a raging torrent in a matter of hours. For this reason, we utilize two different sections of the creek, depending on water levels. When the creek is not dangerously high or too shallow, we will run the canyon section. On the other hand, should a “high flow event” be predicted or if the creek is at below normal levels, we will paddle a lower section of the creek, launching in the village of Gowanda and taking out at Sprague’s General Store in Versailles, NY. Having taken care of the obligatory paperwork and gotten into your wetsuits, you’ll board our bus for the 20-minute ride to the launch site. Once there, the trip leader will give a safety talk, check your gear, and introduce you to your raft. Assuming we’re running the canyon section, the first hour of the trip allows you to gain confidence in your paddling abilities and enjoy some of the peaceful solitude within the Zoar Valley State Forest Preserve. After stopping for a hot cup of soup, the wild ride begins. The pace quickens after the South Branch of Cattaraugus Creek empties into the main channel. If the river is high, plan on experiencing the most exciting raft ride in Western New York! 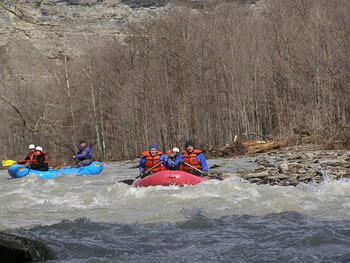 The rapids continually build, with names like “Pinball”, “Larry, Curly, and Moe”, and “Cruncher” jostling you about as you paddle frantically to keep pace with the guide’s instructions. Back in town, “Grand Finale Rapids” will test everyone’s mettle and skill, putting your heart in your throat. Upon reaching the takeout, it's just a short walk back to our offices where you can dry out, warm up, and then join us either upstairs in the guest lounge (or next door at the Wicked Glen Restaurant and Tavern) for the complimentary post-trip pizza party. When we utilize the lower section of the Cattaraugus, the trip is about an hour shorter. Following a short walk from our office to the launch site and a Safety Talk, it’s time to head downstream. This section of the creek offers easy to navigate class I and II rapids. What it lacks in excitement it makes up for with scenery very similar to that found in the upper canyon section. One of the highlights of almost every Gowanda to Versailles river trip is watching the eagles soar overhead. Upon reaching the takeout, our bus awaits to bring everyone back to the office. Later in the spring we also offer sit-on-top kayaking trips on this section for those of you who’d like a more intimate experience on the water. Advance reservations are mandatory.